A post office was opened only in 1861 though in 1824 a letter is said to have been ‘privately carried’ to Europe. Until the boat service “Messagerie Maritimes” took over the mail contract in 1866 mail to and from Seychelles could not be transported on a regular basis. The earliest known letter using the service was dated 3 April 1865. Colonial reports brought out the extreme communication difficulties though in 1877 the Mauritius Post Office reported that letters to and from Seychelles numbered 14,184(543 were registered). The Post Office became autonomous from Mauritius on 1 August 1884. 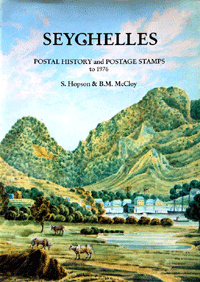 It was in 1893 that the first local post was introduced in Seychelles. The non-commissioned officers in charge of the Police stations acted as receiving and dispatching officers. The service was closed on 31 July 1894 as it proved too much for them to cope with. The new Administrator, Sweet Escott, who arrived in the Colony in 1899 saw that the postal service needed improvement and introduced a new Inland Post Service The British India Steam Navigation Company(BISN) had began their contract in August 1895. The quarantining of ships is said to have undoubtedly affected the mails from time to time. In 1920, the local post is said to have covered the whole population, and not only Mahé and Praslin, including the outer islands and from 1965 the British Indian Ocean Territory. Chapter Two of the book deals with mail by air which was introduced on 23 September 1932 and became effective on 23 February 1938. It could be sent either through Karachi or Nairobi.. It was on 21 June 1939 that the first civil flying machine arrived in Seychelles from Australia. . The Royal Air Force in 1943 established a base in Seychelles and the Catalina flying boats operated communication flights between Seychelles and Mauritius, Madagascar and Kenya. They carried mail in and out but were only authorized to carry properly censored mail for members of the armed forces. In January 1953 the East African Airways Corporation attempted to introduce the first air mail from Seychelles with a Catalina amphibian. The service was not economic and was withdrawn. As the United States Air Force (USAF) built its Satellite Tracking Station on Mahé in 1963 it introduced the service of a Grumann Albatross amphibian which flew from Mombasa. It started to carry first and second class air mails from 19 August 1964. The Wilkenair (later Air Kenya) introduced an air mail service with its first flight on 2 May 1970. Then on 4 July 1971 with the opening of the International Airport there was a new weekly direct air mail service between Seychelles and London by a BOAC VC 10. Chapter Three of the book deals with censorship, both civil and military. During World War l there was no regular censorship of civilian mail to or from Seychelles, it is said. Though all correspondence to what was considered enemy territories was examined by the Governor before dispatch, up to 28 May 1919. During World War ll censorship of mail, telegrams and newspapers started early in Seychelles. The original censors were Government Officers, Police Officers and retired Military Officers supported by staff from Cable and Wireless, for the censorship of telegrams. Chapter Four deals with Mauritius Postage Stamps used in Seychelles as the Victoria General Post Office opened in 1861 was a sub-office of Mauritius and did not have its own postage stamps. The definitive postage stamps of Queen Victoria came in six issues provisionally in 1893. The chapter notes that two series of stamps were issued during the reign of King Edward Vll, the first in 1903 and the second in 1906. The King George V postage stamps were in April 1912 while King George VI came in 1936 shortly after the death of George V. In 1937 there was the Coronation issue while the Silver Wedding issue came in 1948. The first stamp issued during the reign of Queen Elisabeth II was the single stamp of 9 cents to commemorate her coronation. The stamps issued by the Seychelles postal authorities between 1953 and 1976 included several sets on history, heritage, current times….a large number of commemorative issues some directly related to Seychelles while others of less or no connection. Among the commemorative issues were two stamps in 1956 to celebrate the Bicentenary of the Stone of Possession, the Centenary of the first Seychelles Post Office in 1961, the Bicentenary of the First Landing on Praslin in 1968, the completion of the International Airport in 1971, the Royal Visit in 1972(Queen Elizabeth II and Prince Philip), the Seychelles Festival of 1972, Internal Self –Government in 1975 and Independence in 1976.